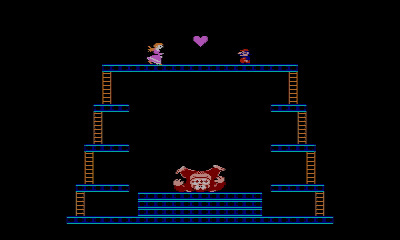 The legendary arcade title Donkey Kong is slightly infamous for receiving a rather botched NES conversion. Lacking several screens, animations and even an entire stage, it wasn't exactly one of Nintendo's finer porting jobs, especially when other home versions by different companies did manage to include all of the original content. Rumour has it that Nintendo was at one point planning to release a second version of the game for NES which restored these features, somewhat similar to a second version of Mario Bros. released later in the system's life, but for reasons unknown it never saw the light of day. Finally, a few years ago, as part of two special promotions, Nintendo released Donkey Kong: Original Edition on Wii in Europe, and later 3DS in North America; now, it's simply available to purchase in the 3DS eShop. Naturally this is, for the most part at least, the same NES version of Donkey Kong that's already been made available on every Virtual Console thus far — a home port of the classic arcade game that has Mario (or Jumpman, rather) climbing ladders, jumping over barrels and whacking flames with hammers in order to reach the top of a construction site and rescue his beloved Pauline from the clutches of Donkey Kong. Once you've succeeded at your mission the game will start over, looping endlessly and getting harder each time until you lose all your lives, making it one of those games where the point is to try and improve your highscore each time you play. 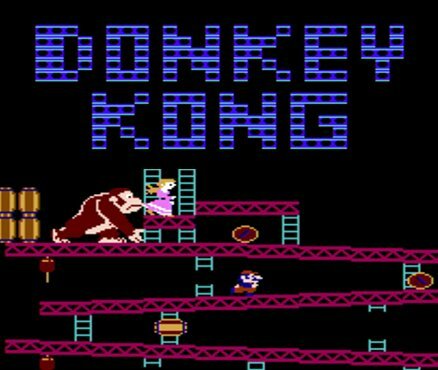 Although it's still not an arcade-perfect port, Donkey Kong: Original Edition reinstates a few of the things that the original NES release was missing. The most significant of these is that the second stage, with conveyor belts transporting cement, is now accounted for once again. It's arguably the most annoying out of the four stages, but it was always a bit silly that such a short game somehow lost an entire stage in the transition to home consoles; it's good to see it back. 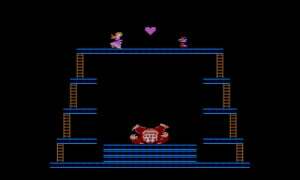 A few other less important things have also returned, such as the animation of Donkey Kong grabbing Pauline and climbing up to the next stage every time you reach the top; inexplicably, though, the iconic screen in-between stages with multiple Donkey Kongs stacked on top of each other that shows what level you're on is still missing in action. Since this is basically the original NES release of Donkey Kong with some additions, it means that the NES-exclusive features are also still available — you can still opt to play a secondary game mode in which the game gets harder much faster, as well as a two player mode where, if you link up with another 3DS, you can take turns tackling stages. While the original Donkey Kong is a classic title, there's no denying that it's starting to shows its age. The gameplay itself is timeless, but even with the full set of four stages it's a very short game, meaning the only reason to keep playing after 10 minutes is to shoot for a highscore. This version naturally makes the other NES version of Donkey Kong completely obsolete, but we can only really recommend it to those that are exceptionally interested in what the NES port could have been like had Nintendo gotten it right the first time. As it stands, this release is about 30 years too late! Got it from the promotion like 2 years back, it was neat as a little rare download. I'd actually purchase an arcade perfect port to the Wii U. This appears to be just for collectors. I'm pretty sure this isn't available on the 3DS eShop in NA. It was only available here once via a promotion. Going to pick this one up tonight for sure. Been wanting to try that level since I found out about it. That 9 appears to be upside-down. I wish they could release the arcade originals in some way. When I played "Luigi Bros." in Super Mario 3D World it was such a letdown. But oh well. @bezerker99 You are correct. I think NintendoLife has it wrong, because it is in their "Out Now" list for the US market. I missed out on the promotion, so I would buy it if they make it available here. I wish they'd release ALL their arcade games, including the VS arcade games – either in compilations or on Virtual Console. But since we can't even get their biggest hit in arcade form, the chances remain very remote, unfortunately. I didn't even know this was released. I'd like to point out that the version available for purchase is NOT the "Original Edition". At least not in North America. The only real port was included in DK64. I can't believe how neglectful has Nintendo been for their arcade games. Honestly, if I want to play this game at all, I'll just hop on over to the nearest Dave & Buster's and, with quarters in pocket, play to my heart's content. I always found it really funny that the second stage was missing, I was so used to seeing taht while playing Donkey Kong 64. First game I fell in love with as a kid. It'll always be a 10, but I'd sure love to see the Colecovision version in the e Shop someday. So happy to have the promotional freebie version of this game from last year. 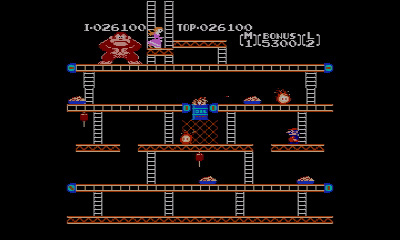 Love this game and have always thought it was crazy how Nintendo has considered the home version of Donkey Kong a 3-level only game for the better part of 30 years. And, Nintendo... where's Popeye, already!!?? Why don't they just release the arcade version? @JaredJ Nintendo doesn't own the rights anymore. The real owners of the arcade game are Ikegami Tsushinki Co., Ltd, a company who developed the hardware and the program code for it. @SuperMalleo I didn't know that. I hope this version of DK sees a Wii U eShop release at some point. Anyway, this version is quite expensive for only one additional stage to a game we should have already. BTW, the rating is too low Donkey Kong O.E. deserves a minimum 8/10, or as one poster put it, "the 9 is upside down." I'm so getting this. Looks good! 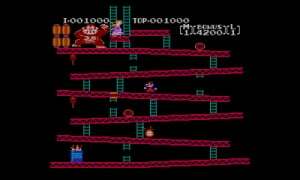 The version in Donkey Kong 64 is a faithful adaption of the original Arcade imo. For now this is going in my Wishlist, as I already have a discontinue Homebrew version for the NES. ANd I feel Nintendo still missing an opportunity to release their Arcade Editions to the VC (such as the Vs. Series). Yeah the DK64 version is still the best. Why the hell couldn't they bring that one over instead? What the hell is wrong with Nintendo? And why the bloody hell couldn't they have added back in the "How High Can You Get?" screen? @ShaneBolda What is the DK64 one like in comparison to the real Arcade Machine ? @SuperMalleo So how did it get included in DK64. If that never happened then I might have accepted that explanation. @unrandomsam They probably lost the rights after DK64 was released. The DK64 port is not original, albeit it is one of the most faithful. To unlock the full game playable from the extras menu, you first had to rescue a fat Rareware coin instead of Pauline. @OneBagTravel Looks like you have finally received your wish... except for Switch!